Last we checked in Daniel Filho, mastermind of the DFRF Enterprises Ponzi scheme, was scheduled to stand trial on November 7th. With proceedings less than twenty-four hours away, I decided to check the case docket and see if the trial was still on. Turns out it isn’t, primarily due to ongoing concerns about Filho’s mental competency. Daniel Filho’s mental competency was first brought up back in July, through a motion requesting a competency evaluation and hearing. The aim of the competency evaluation and hearing would be to determine if Filho has the ‘ability to consult rationally with an attorney to aid in his own defense and to have a rational and factual understanding of the charges.‘ Filho’s overall mental status and state would also be examined. 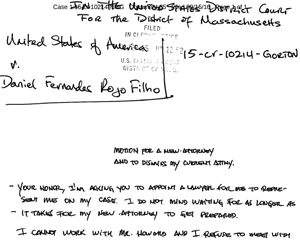 Following the competency motion filed on July 18th, Filho filed a hand-written motion on September 15th. In the motion Filho asked Judge Gorton to dismiss David A. Howard and appoint him a new attorney. Your Honor, I’m asking you to appoint a lawyer for me to represent me on my case. I do not mind waiting for as longer [sic] as it takes for my new attorney to get prepared. 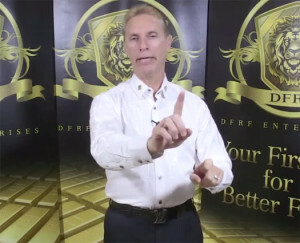 I cannot work with Mr. Howard and I refuse to meet with him anymore, because he doesn’t believe in my case and because I told him matters that are very important to me which I believe with all my heart and I told him that information in strict confidence to be protected by attorney-client privilege. Instead of keeping my confidence he revealed these matters in a motion to try to make me look like a fool or like I am creepy. I thought that I could trust him but I cannot and I do not have any more to hire an attorney. I therefore ask you to remove him from my case because I do not trust him. Filho’s original motion for a competence hearing was filed under seal. I’m assuming whatever information it was he didn’t want shared with the court is in that motion. On September 22nd a hearing on Filho’s attorney motion was heard. Following an ex part colloquy with Filho and Howard, Judge Gorton ruled Howard would ‘continue to represent Filho until subsequent counsel is appointed‘. A competency hearing scheduled for October 12th was cancelled but Filho’s November 7th criminal trial date remained standing. On September 27th, Filho was appointed new counsel and David Howard was terminated. On September 28th Judge Gorton cancelled Filho’s Final October 12th Competency Hearing, Pretrial Conference (November 3rd) and criminal trial (November 7th). Filho’s new attorney was given until October 25th to get up to speed with the case. On October 25th a Status Conference hearing was held. At the hearing both the DOJ and Filho agreed that a competency examination and hearing, if necessary, should be held. Filho was ordered to undergo a competency examination sometime this month. A report from the Doctor conducting the examination is due to be filed no later than December 19th. If a competency hearing is required after the report is filed, it has been penciled in for January 24th, 2017. As per the case docket, for now there’s no indication that Filho is unhappy with his current attorney. Filho himself remains in the custody of US Marshals. I’m not sure whether Filho’s competency examination report will be filed under seal. Filho seems pretty protective of whatever information he gave his first attorney, so if it’s in the report I wouldn’t be surprised if the report is sealed (at least for now). Pending something happening prior to the December 19th report filing date, our next update will be around that time. Update 2nd February 2017 – It seems there has been a delay in evaluating Daniel Filho’s mental state. On December 23rd a sealed document was filed (presumably a report from a doctor). Owing to the sealed nature of the filing I can’t tell you why, but a second competency evaluation was requested in early January by the DOJ. On January 11th the request was granted. The competency hearing has been rescheduled for March 24th. Pending any further delays, hopefully we’ll get a substantial update then. Update 26th March 2017 – The competency hearing didn’t take place. The second competency evaluation did take place and a report was filed under seal on March 15th. I would like to file a claim against DFRF. How can I do it? You can’t at the moment. The SEC’s civil case has been stayed pending the outcome of criminal proceedings against Filho. I would like to file a claim against DFRF.How can I do it? Article updated with news of delays. Filho’s competence hearing has been rescheduled for March 24th.